Home » How to Manifest » How Long Does It Take for the Law of Attraction to Work? When you use the Law of Attraction, the things you don’t really care about manifest almost immediately. You simply think about them once, forget about them, and then suddenly you have them. But when it comes to the things you really want to attract, it takes forever. You make list after list of what you want, getting as clear as possible. You do everything you’re supposed to…and still nothing. So how long does it take for the Law of Attraction to work? Is it even possible to know how long it will take for the Law of Attraction to work? Well, yes, in a sense. You see, it all depends on you. Whether something appears instantly or takes years to come into your life, depends on how attached you are to the outcome. The things that appear quickly in your life do so because you don’t care about the outcome. …but it is because if you never get them, it’s okay. Sometimes it might be a shirt or a favorite food that will appear quickly. All you did was think about how nice it would be to have it and then went on about your life as if it wasn’t a big deal, as if everything was already okay exactly as it was. And then before you knew it, what you wanted was there…everywhere, in fact. People were talking about it, sales ads for it appeared all over the place, you received dozens of e-mails related to it, and then, suddenly, you actually had it. The whole process was effortless… like the entire world conspired to give it to you. You even had little clues – the overheard conversations, the e-mails – to let you know it was on its way. But the new job, the relationship, the things you really want and care about, they still haven’t appeared. But you’re still looking around and not seeing what you want. Why is it taking forever for the Law of Attraction to work? 1. Because your thoughts create your reality, when you notice you don’t have what you want or that it is taking a long time for it to manifest, you’re creating more moments in your life where you don’t have what you want. You think you don’t have the new house or new job… you create not having them. You think it’s taking forever to manifest your soulmate… you create it taking forever. …you’re telling the Universe you don’t trust it to bring you your desire. Your job is to trust the Universe. You’re supposed to ask for what you want and allow your desires to appear, trusting that they will. 3. What you want to attract is not really taking forever to manifest. Sometimes there are factors involved in creating your desires that you’re not aware of when you ask for them. These factors can prevent you from instantly receiving what you want. For example, if you desire a new car, you want more than a certain make and model. You also want it to run well, to be affordable, to have a great time purchasing it, and so forth. These elements also have to be created. And no matter how badly you want your car right now, however long it takes for everything to come together is exactly the right amount of time needed. 4. When you feel nervous, anxious, impatient, or scared, you are pushing away the very thing you want. That is why it is so important to detach from the outcome. Detachment is not caring whether you’ll get your desire. Detachment is being okay with things being exactly as they are now. Detachment is feeling hope that you will get what you want, but still enjoying the process that takes you from where you are now to where you want to be. When you enjoy where you are now and live as if you already have you desire, the sooner your desire will manifest. 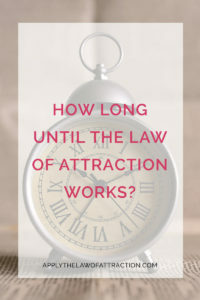 So, ultimately, you decide how long it will take for the Law of Attraction to work and however long it takes is exactly the right amount of time for you. I’m really enjoying your website. It is enjoyable! I must admit I have lost faith in The Law of Attraction as I have not been successful in getting it to work. But the website is set up well and easy to navigate….and I’m enjoying it! We’re so glad you’re enjoying the website. It really means a lot to us. If you have any questions, please let us know. Fantastic website. Lots of helpful info here. I’m sending it to several friends and also sharing in delicious. And naturally, thanks in your effort! Hi Gio, You’re welcome! Thanks for letting us know you like the site and for sharing it with your friends! You’re welcome Chris! It’s great you have such a positive outlook on getting your big wishes. You’ll be able to manifest them even faster with it. But something still bugs me… You say that qualties that someone would need e.g. A car will take long. So if i asked for a record deal with a record label like Sony BMG; would the things that come with it in order to make the manifestation perfect… Would THAT take forever??? I didn’t say it takes a long time. I said it takes as long as it needs to take. There are things you can do to speed up the process, as I’ve discussed in other articles, such as Using Heart Energy to Manifest Your Desires. The ultimate factor in how long a manifestation will take is you. What you ask for is what you will get. Your thoughts and your energy are how you ask. If you have no doubts, fears, or attachment to the outcome, things can manifest quickly, even instantly. This includes cars and record deals. With the Law of Attraction, things only take forever if you think they take forever. If you think they happen quickly, they happen quickly. It’s all up to you. The manifestation will come with all of the things you include in the manifestation. When you ask for the record deal, ask for all of the elements you want in the record deal. Ask for the perfect deal. Decide what you want. Get clear. Ask for it. I have a doubt. You say we apply law of attraction, we belief in sumthing, creating images in our mind sounds positive.. But in Hinduism, the a term called ‘vitti’ which means fate. everthing u gonna get is based on fate. the god already decided what you shud be..and there is also another term tat is ‘vole chudi’ which means the story of person had written before this. My question is do this law of attraction have the ability to overrule this fate written by the god? With the Law of Attraction, we create our own fate. No one else determines what our future will be. i have been working law of attraction since 4 months but no results in fact i lost confidence and hope after i faced reality or the results of my dream and aspiration …i did all i can like make lists,thnk positive ,trust …n all of that .i always aspired to get admission into the college of my wish but i did not even after working really hard for its entrance test …….you said that” it takes time as long as it needs to take” but wat is the use of it working afterwards ….. It sounds like you have resistance that’s preventing you from manifesting your dreams. The following article can help: 4 Great Ways to Overcome Resistance in Law of Attraction. Right now things might seem impossible to you, but they really aren’t. If you can get rid of your resistance and raise your vibration, miracles can happen. You can still get into the college you want, whether it’s by transferring or by the Universe rearranging things so that the school comes back to you now. When you’re truly ready from a vibrational standpoint, it will happen. Don’t give up! So all i need to do is be patient and detach from the outcome and not constantly think about it. Just be positive in everyday life and know that i will get what i want when the universe decides? Very well-written and straight forward article. Thank you. I was hoping you could shed some light on fears and the law of attraction. I fear my fears. I worry that what I’m worrying about on a regular basis will be attracted/manifested into my life. For example, I have this phobia of my apartment building catching fire (considering I have no control over what the other tenants do in their apartments and have to blindly trust that they’ll be cautious and responsible.) The more I focus on this, the more I seem to hear about others’ fire-related tragedies or see things on TV and the web that relate. This just reconfirms that my thoughts are very powerful and it’s scaring me. I’m often too scared to go to sleep. What can I do to take control of my thoughts here? How can I stop fearing the law of attraction? What are some ways you can detach yourself from the outcome? I’m trying to manifest money so that I can return to college but I don’t understand how I can detach myself when sometimes visualising my life there is the only way I can get through the day. My life at home is really unstable and sometimes even unsafe. Getting to go away to college was the best thing that couldve happened to me. I left the love of my life, my friends, my education, and many other things back there. Its so hard to wake up everyday and not be there. I’ve been trying to manifest this for almost six months now and I haven’t given up but I have questioned the universe in the past. I always correct myself afterwards. I can’t keep my mind off of it though. Maybe I should try manifesting with heart energy. I have been trying to get my boyfriend back for a few months now. I keep coming close. I got him back once for a while but then he said he didn’t want us to be together again. Then after doing a lot of research and work w/ the LOA he wanted to see me last Sunday. But he still said he doesn’t want to get back together. I visualize, pray, and try really hard to let go. However, I get a lot of signs that it is manifesting. I contact him when I have a thought about it, but I don’t know if that is taking action or just being impatient? I know I can do it, I’m just not sure what I’m doing wrong. Please help me! I really really appreciate your website and all your help. Thank you so much. Hey Elizabeth, I finally bought your kindle version book and read it twice already. I really loved it. Thank you for it. However, when I’m reading your book till that time I would feel positive and good but then when im doing my normal routine chore I feel upset and always in this thought whether I will get what I manifested. Also, you said create the world where you are with a specific person. How do I put my thoughts beyond the reality? Like what do I do to feel that I already have what I want in order to feel good and have a high vibrational energy? Because im always thinking about my ex boyfriend and what he must be doing..how do I deattached myself from the outcome? Please guide me through this. Thank you in advance. Are You Having Trouble Letting Go? You should also reread chapters 7 and 9, and follow the techniques in them. I love that you explained this crystal clear! 😀 thank you for this! I am wondering something. In this article it says “Detachment is feeling hope you will get what you want, but still enjoying the process” and Detachment is not caring if you get your desire”. I am reading your book about Manifesting Love, and in your book you mention that hope is a watered down version of faith. Have faith your desire is yours, never once consider anything but succeeding, etc. I really like your book and am applying the techniques. I see myself as having let go, I trust the Universe, and have faith that my desire is mine already. There is no reason for me to doubt the Universe or worry or anything like that. But from your article I was wondering am I misunderstanding detachment? Thank you! I am new to LOA. Based on what you wrote about what you’re doing, it sounds like you understand detachment. As long as you aren’t worrying about whether it will happen, focusing on why it isn’t here yet, or really, doing anything other than having absolute faith that it’s yours already, then you’re most likely detached from the outcome. Awesome thanks! And thank you for answering both of my questions on different posts. I really appreciate it. Your site and your book are wonderful! I have found so much help within both. Reading your posts and replies has helped me on my journey . Thanks so much Remy! I’m glad I could help. hi, this is to ask- isnt it better to not focus much on thinking which is like building air castles and focus on karma ( action) instead that will for sure bring some results? so bascially my doubt is- what matters the most – thinking or acting ? I need immediate money and I have been practicing Law of Attraction regulary however getting no result. Please suggest. I really like this posting. I bookmarked it for future reference. FSS says, “Your ships come in over a don’t care sea.” Thank you for your work! I’ve come to realize when I really really really want it, I get it. The key is to never worry about how. I always say outloud “I don’t care how I get it, JUST GIVE IT TO ME”. I know I sound like a whiny brat to most. But that’s how me and the universe communicate with one another. I never care how, but I do care when. I usually say “I want this before *insert day here*, and I don’t care how I get it”. Also here is another key, draw,cut-out, or write what you want, tape it on your wall or ceiling depending on what angle you wake-up on. So as soon as you wake up you’ll still be in that theta/deep alpha state and you’ll see that “reminder”, then close your eyes and visualize it. That has worked wonders for me. What tips do you have to detach from the outcome that you want to attract in your life that you find dependable for yourself to have. My goal is really huge and I always thought it really needs time to be manifested (I don’t think ”it takes forever”, but ”it needs time”, but I guess it’s no difference for LoA), anyway, I want to change it. Will saying ”I manifest my goals quickly” during visualization or affirmations is a good way?